At the California State Indian Museum in Sacramento, California, there is an exhibit displaying the progression of women’s regalia, from pre-contact to post-contact period, of the Hupa, Yurok, Karuk, Tolowa, and Wiyot people. The women’s regalia, featuring long dentalium necklaces covering the bust, buckskin and maple bark skirts with fine beading, and intricately woven basket hats, demonstrates the beauty, mastery, and artistry of California Indian regalia. This exhibit is important, not only to display the cultural importance of regalia, but to also demonstrate that Indians of Northwest California continue traditional practices of jewelry and regalia making despite the supposed "disappearance" of their culture. Despite the violent effects of colonization California Indians continue their traditions in the modern day through contemporary beadwork, basketry, and jewelry making. Jewelry of Northern California incorporated elements of resources found in the area and acquired through trade. These included dentalium shells, pine nuts, bear grass braids, and abalone shells. Dentalium shells were an important resource because they signified currency and economic status within the community. Dentalium shells were traded from Vancouver Island and made their way to Northern California as well as out to the Midwest. Necklaces made of these materials, along with beaded under skirts, bear grass braids, and intricate basket caps, are worn for special occasions such as the World Renewal Dances and the Flower Dance. These occasions gave the opportunity to display wealth and status while simultaneously renewing the world and preparing youth for the responsibilities of adulthood. Post-contact and settlement beginning in 1828 gave way to violence, assimilation, and colonization. Anthropologists that “studied” tribal communities did so under the guise that tribal communities were “disappearing” rather than adapting to a new way of life. The myth of the “vanishing Indian” was not a new concept when Curtis began his twenty-volume work, The North American Indian. To anthropologists such as Alfred Kroeber and Edward Curtis, the Hupa, Yurok, Karuk, Tolowa, and Wiyot people were a dying people. In true Eurocentric fashion, Krober and Curtis sought to depict California Indians in a romanticized light complete with beads, feathers, and a stagnant future. Curtis’s photographs perpetuated the stereotypes of the noble Indian in Northwestern California. Curtis depicted members of the Northwestern tribes in traditional dress, often-wearing buckskin loincloths, basket caps, beaded necklaces, and dance regalia. What anthropologists and historians failed to grasp was that rather than remain stagnant, tribal communities adapted to the circumstances that surrounded them. This included adopting new ways of interpreting and privileging their culture through jewelry, basketry, and art. The disruption of the world through colonization changed the way that the Native people of Northwestern California interacted with it. After white encroachment reached a fever pitch in the years following 1828, tribal members were forced to assimilate to the white man’s ways by adopting western forms of dress, work, and religion. Basketry, regalia, ceremony, and contemporary jewelry designs continued in spite of the U.S. government’s efforts at assimilation. Despite the efforts of some tribal members to continue traditional practices, certain ceremonies, such as the Fish Dam Ceremony, have not been performed since colonization in the area (Thompson, xxvi). Regalia and jewelry makers such as Josephine Peters (Karuk) learned their craft from tribal elders who continued the traditions in spite of white encroachment. The era after colonization was one of transition for tribal communities. By 1951, a pottery guild formed in Hoopa to help combat a void left by the loss of basketry materials (Ortiz, 52). By 1959, a group of women formed, including Josephine Peters and Vivian Hailstone (Yurok), to revive basket weaving. During the 1950s and 1960s, several members of the Hupa, Yurok, and Karuk tribes travelled to county and state fairs to demonstrate dances that melded Plains and North Coast traditions. These trips included basketry demonstrations and booths that sold contemporary jewelry from the tribes of Northwestern California. This revival continues into the present day traditions that thrive within contemporary California Indian culture. 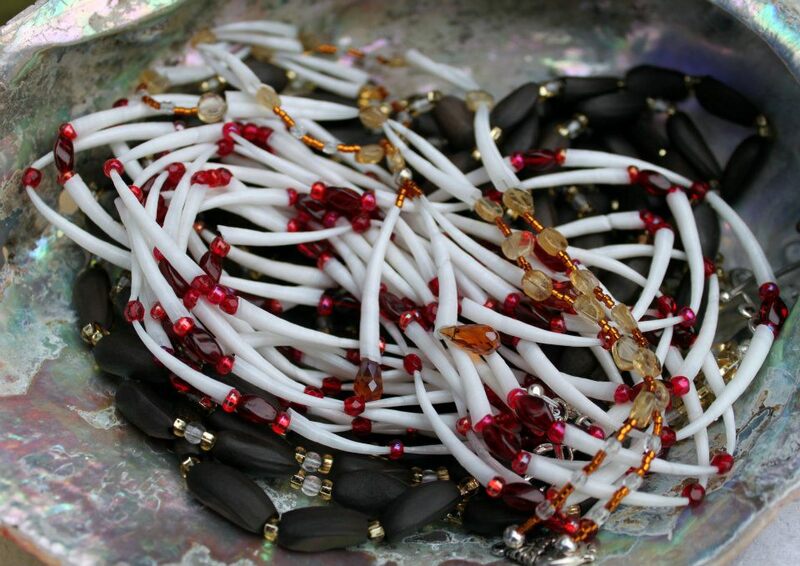 Contemporary jewelry, such as necklaces, earrings, bracelets, and rings fashioned from pine nuts, glass and plastic beads, dentalium shells, abalone, and silver are currently used in ceremony and as items for sale. California Indian contemporary jewelers sell their art in museums, cultural centers, at big times and other cultural gatherings, and often gift jewelry to family and friends. Jewelry making never disappeared, despite what anthropologists believed, because it was tied to ceremonies, such as the Flower Dance, that continued even when violence threatened the lives of California Indians. Jewelry transformed over time and united western materials and traditional cultural practices in a ways that reflect both the past and present experiences of Native artisans. The effort of regalia makers to create in the face of adversity speaks to not only the desire to continue their culture but to make a livelihood in changing world. They challenged the notions of the “Vanishing Indian” by not only adapting to new forms of regalia making, using western-style beads and other materials in their jewelry and basketry, but also by selling these items in the western market. Today, contemporary jewelry makers create to demonstrate the beauty and complexity of their cultures while also privileging their experiences, both in the past and toward the future. The Native Women's Collective is proud to work with many artists who are blending the contemporary with the traditional. To find out more about our artists click here!